This tutorial aims to show a lot of blues style techniques that are possible while holding down an open A major chord. 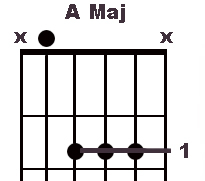 It is important to use the shape shown so if this way of playing an A chord is new to you it's worth spending some time just on the chord before launching into the lessons. The chord itself is very easy - it's more the right hand selective strumming that may require a bit of practice to avoid hitting the top and bottom strings.